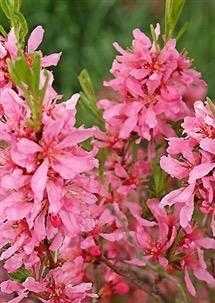 Spring pink flowers star like all along the upright stems. Rich autumn colours. 90cm tall, sun or semi shade. If pruning required best done in summer to avoid a disease called silver leaf.